Fig. 14 The Business Strategy process. choice of growth mode: deciding for each particular area of activity the most appropriate means of expanding its business interests; for example ORGANIC GROWTH or EXTERNAL GROWTH via MERGERS, TAKEOVERS, JOINT VENTURES and other forms of STRATEGIC ALLIANCES. COMPETITIVE STRATEGY: deciding on the basis of an evaluation of the firm's own competitive strengths and weaknesses vis-à-vis those of its rivals and the requirements of customers, the best means of establishing a position of COMPETITIVE ADVANTAGE (lower price, innovative products, etc.) over rival suppliers. establishment of appropriate ORGANIZATIONAL STRUCTURES to facilitate the firm's goals. This involves ensuring an efficient and co-ordinated effort from the various operational divisions of the firm: MARKETING, PRODUCTION, etc. through appropriate management and organizational structures. review and control: to identify problems which are preventing the firm from achieving its goals and devise means of overcoming these problems or amend goals and strategies where problems cannot be overcome. Fig. 14 shows the various steps in the business strategy process. strategy implementation, which involves implementation of the selected strategies. One model of business strategy formulation suggests that the three steps above follow sequentially with top management determining objectives and developing strategies which are then communicated to middle and junior managers and arrangements made for strategy implementation. This model is often characterised as the rational or prescriptive approach to strategy which is based upon formal, top-down strategy processes, using designated strategy teams, planning units and formal collection of information. Some authorities on strategy such as Mintzberg argue that strategic processes are less rational than those implied in figure 14. They argue that the three steps involved in strategy formulation are not linear and rational and that all three steps happen at the same time in different parts of the organization. They argue that objectives change and can conflict; that senior managers share responsibility for setting and implementing strategy with middle managers, that strategy cannot be decided in advance by top management; that formal processes are too slow to allow business to be dynamic; and that formal strategic processes are impossible to pursue in uncertain business environments characterised by complexity and dynamism. The critics of the rational strategy model suggest instead that the strategies which emerge in businesses are a combination of planned strategies and unanticipated “emergent” strategies. This emergent strategy approach suggests that strategies may be realised because of, despite, or in the absence of, objectives – they simply happen along the way. Such an approach sees the essential role of managers as moving their organizations along in small incremental steps rather than relying on visions or strategic plans. The emergent strategy approach sees no clear distinction between the steps of strategy development and strategy implementation: instead it views the business as learning by experimentation and discussion as strategies are developed, implemented, revised and adapted. A further distinction is often made between market based and resource based business strategies. The market based view suggests that strategy should start with strategic objectives which seek to define what markets the business is in and which markets it seeks to serve. By contrast the resource based view starts with an audit of the business's resources which seeks to identify which of the business's activities cannot easily be copied or improved upon by competitors. These activities represent the core competences of the business and management should seek to develop products and markets which utilize these competences. Such a resource based approach focuses on developing core competences, bases strategy on present resource endowments and avoids the business losing sight of what it is good at. Resource based strategy tends to be incremental and fits well with the emergent strategy approach. 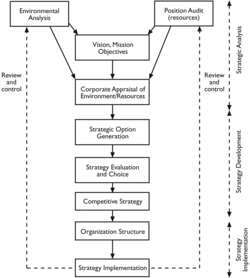 Corporate Strategy which is determined at the corporate centre or head office of the organization. Corporate Strategy deals with the overall purpose and scope of the business dealing with such issues as acquisitions and mergers; divestment; and diversification. Business Strategy which is determined by strategic business units within the organization, each unit being responsible for developing, producing and marketing a related group of products. Such business units deal with COMPETITIVE STRATEGIES for beating competitors in the relevant markets. Functional Strategy which is determined by operational units within each strategic business unit which are responsible for business functions such as marketing, production and human resources. See BUSINESS PLAN, HORIZONTAL INTEGRATION, VERTICAL INTEGRATION, DIVERSIFICATION, INVESTMENT, ENDGAME STRATEGY, TURN-ROUND, MANAGEMENT BUYOUT, MANAGEMENT BUY-IN, MARKET ENTRY, MARKET STRUCTURE, MARKET CONDUCT, MARKET PERFORMANCE, STRATEGIC GROUP, FRANCHISE, BARRIERS TO EXIT, BARRIERS TO ENTRY, CORE SKILL, CORPORATE RESTRUCTURING, BUSINESS PROCESS RE-ENGINEERING, CRITICAL or KEY SUCCESS FACTORS.